On October 29, the fifth grade team had a great time bonding as advisory groups as they competed to win the Fifth Grade Advisory Bowling Challenge. The kids were very encouraging of one another—it was awesome! 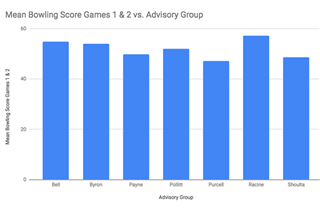 After bowling, students worked in their math and science classes to do data analysis on the bowling scores from each advisory group. The mean scores from both games for each advisory group were compared in a bar graph to determine the winner. This year, Mr. Racine’s Group won!